CINDERELLA & PRINCE CHARMING PRODUCTION DRAWING WALT DISNEY STUDIOS RED, BROWN, & GRAPHITE PENCILS ON PAPER, 1950. 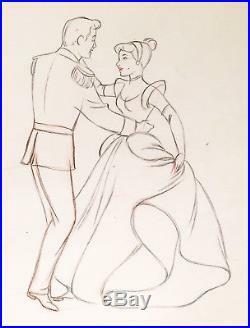 Original production animation drawing of Cinderella dancing with Prince Charming in red, brown, and graphite pencils from "Cinderella, " 1950, Walt Disney Studios; Numbered 129 in pencil lower right; Unframed. The 1950 Walt Disney feature film "Cinderella" was based on the French version of the tale by Charles Perrault, entitled "Cinderella" and written in 1698. The film was the second in the series of great Princess films developed by Disney, the first being Snow White in 1937. The character of Cinderella is usually front and center in the pantheon of Disney Princess merchandise, perhaps because she is the only Princess not to be of a noble blood line who ended up marrying a Prince and becoming royalty. Cinderella was animated by both Marc Davis and Eric Larson, however the two animators had different perceptions of the character, with Davis preferring elegance and Larson opting for simplicity. This actually worked in the film's favor, resulting in Cinderella being a much more complicated character than her predecessor Snow White. As with other Disney films, the studio hired actress Helene Stanley to perform the live-action reference for Cinderella. She would later return to the studio for the characters of Aurora in "Sleeping Beauty, " 1959 and Anita Radcliffe in "One Hundred and One Dalmatians, " 1961. According to Christopher Finch, from his book "The Art of Walt Disney". Disney insisted that all scenes involving human characters should be shot first in live-action to determine that they would work before the expensive business of animation was permitted to start. The animators did not like this way of working, feeling it detracted from their ability to create character. The animators understood the necessity for this approach and in retrospect acknowledged that Disney had handled things with considerable subtlety. About 400 women and girls auditioned for the voice role of Cinderella, but the role ended up going to Ilene Woods. Woods, who at the time worked on the radio and did not know anything about the audition, was asked one day by her colleagues Mack David and Jerry Livingston to sing a song from Cinderella. Without her knowledge, her recording was given by her friends to Disney Studios. After listening to the material Walt Disney immediately decided that he had found the voice with which to speak and sing the character of Cinderella and contacted Ilene. Prince Charming was animated by Eric Larson, who according to Andreas Deja Confessed to some of us newcomers that he felt kind of embarrassed about the stiffness in his performance. The Prince was voiced by William Phipps, and after Phipps's initial audition; the studio was so impressed with his performance that Walt Disney himself offered him the role. William Phipps is perhaps best known for his roles in dozens of classic sci-fi and westerns, both in films and on television. It is a little known fact that Mike Douglas (yes of "The Mike Douglas Show") provided the singing voice for Prince Charming for the song "So This Is Love, "as the Prince and Cinderella danced together at the Grand Ball. A bit of trivia, not only is the name of the Prince never revealed, he is never actually referred to as "Prince Charming" in Cinderella. His name was mentioned only in merchandise and, more recently in the various films and TV appearances of the character. Prince Charming was the first Disney Prince to participate in a duet with his respective love interest, the first Prince to be featured in a wedding celebration, and the first to dance with his heroine just after they met. It does not get any better than this; an original production animation drawing of Cinderella dancing with Prince Charming for the first time at the Grand Ball! Both Cinderella and Prince Charming are full figure and Cinderella's eyes are open. An absolutely beautiful drawing, from the most loved scenes in the entire film. The veteran Walt Disney animator Marc Davis supervised the animation of this scene. 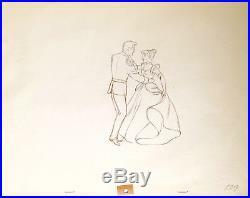 Measurements: Size - Cinderella & Prince Charming 6 1/2 x 4 3/4", Sheet 12 1/2 x 15 1/2". Condition: See pictures below of the actual drawing, which is in excellent overall condition as shown by the pictures below! All items we sell are from a smoke-free/mold-free home/workplace and are in excellent condition, unless otherwise noted. I own every work pictured for sale and I stand behind every item. Please follow/bookmark me as a favorite and keep and keep checking back for more items for sale in the coming weeks. For now, please check out my other Animation Drawings and Cels and other original modern and contemporary artwork for sale! The item "1950 DISNEY CINDERELLA PRINCE CHARMING ORIGINAL PRODUCTION ANIMATION DRAWING CEL" is in sale since Sunday, April 22, 2018. This item is in the category "Collectibles\Animation Art & Characters\Animation Art\Production Art". The seller is "shadowline" and is located in Durham, North Carolina.